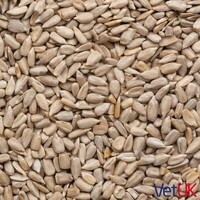 VetUK Sunflower Hearts are loved by wild birds more than any other seed, and are a winner in most gardens. They are 100% edible leaving little mess in the garden, and are high in oil and energy with a great year round appeal. Can be fed from a seed feeder, bird table or ground feeder. Fantastic value. No waste. Encourages a variety of birds to my garden. The birds love this, and they empty the feeders in record time. Dozens of birds in my garden, green finches, gold finches, bullfinches, sparrows, black birds, siskens, black caps; so interesting. No mess left from this feed, would recommend.